Colored pencil artist, Amy Lindenberger has a unique and thoughtful approach to her work, considering that she is using one of the smoothest surfaces possible and colored pencil usually requires a bit of grit to stick in place. 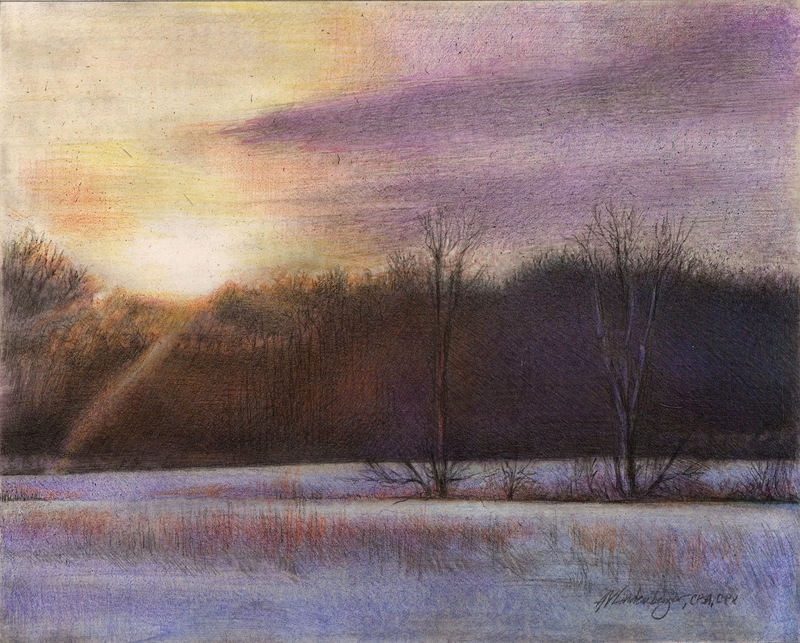 Having worked in colored pencil for more than thirty years, Amy knows the idiosyncrasies of the medium and the tweaks she needs to make to work on a particular surface, like Claybord™. It was high school where Amy discovered colored pencil, but college at the University of Akron where Amy was able to really experiment with other media. She came back to colored pencil because of her love for the translucency of the medium and the layering process that fits her working style and personality. “Not long after graduating, I went back to colored pencil and learned that by varying the surfaces and techniques used, I could achieve results that mimicked the look of other media, in addition to creating the look of colored pencil. I’ve worked exclusively in graphite and colored pencil since 1981, and have never regretted my choice,” Amy explains. Amy discovered Claybord while looking for a surface that wouldn’t require her to frame her pieces under glass. She shares, “I’ve tried a variety of things, but started doing some very small portraits in graphite on Claybord because I liked the bright whites produced by the smooth board surface as well as the fact that the graphite erased very cleanly. One day a customer asked if I could produce a piece on Claybord that was primarily graphite but with a tint of color. I told him I wasn’t sure, due to the fact that the surface is very smooth and colored pencil generally requires a little more tooth to hold the grains of color. But I found that if I applied a layer of workable fixative to the graphite, the fixative provided enough texture for the colored pencil to adhere. Once I made that discovery, more experimenting took place, and it just sort of took off from there.” Amy finishes her pieces on Claybord with Golden Archival Spray Varnish and chooses the finish depending on her subject matter. Amy is a long time Signature member of the Colored Pencil Society of America and the founder and President of the DC101 chapter in Canton, Ohio, which has since disbanded. Along with five other artists, Amy founded the Drawing Room Gallery in Gettysburg PA, formerly known as the Civil War Fine Art Gallery. Amy currently teaches about her soft technique with several upcoming workshops. Fabulous colored pencil artist! So honored to have my art hang beside hers!